Install a robust tracking system directly on your site to start learning exactly how your customers spend their time and what they like to share. 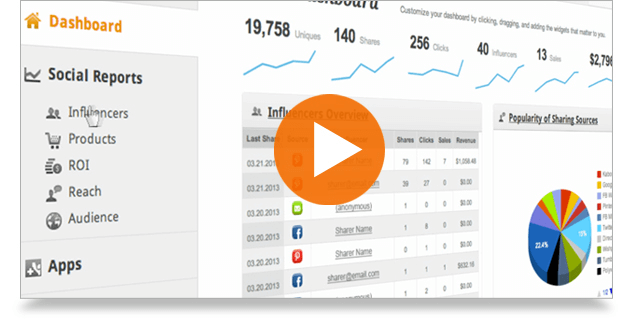 Our Social Analytics app will reveal how many visitors, clicks and shares your site gets. Some of the things we'll be able to tell you are the most popular pages or products on your site, what gets shared and which social networks your customers share to the most. Plus our ROI Tracking app can tell you exactly how much each share is worth across a variety of social networks. Once you have our basic apps installed you'll want to provide and encourage social sharing options on your site. AddShoppers Smart Sharing Buttons work seamlessly with our measurement apps to collect all of that fancy data we mentioned. Then add a Discovery Wall to display your most popular products in real-time! Think of it like your own personal Pinterest wall which only displays your products and content. Continue to expand your customer base and increase on-site social engagements by offering rewards. Apps like Social Rewards and Purchase Sharing encourage your customers to share in order to receive a coupon or after they've successfully completed the checkout process. This reduces the number of people who leave your site to find discounts and prompts sharing at the most opportune time. Combine that with our Social Retargeting which optimizes your budget to engage only those customers which have shown purchase intent and you'll why AddShoppers is loved by over 10,000 merchants around the world. "So far it is really great. Brought in $1,400, only gave away $20 in coupons. I'm a really big fan!" "The support team at AddShoppers is extremely responsive and the product works brilliantly. I highly recommend both the product and the company." "I expected social buttons with maybe a few stats on how often they were clicked. What I got was a delicious explosion of social data. It's very interesting to see how social our users are." "We never knew what a Facebook share or a tweet was worth. Now we can put a $ amount to it and encourage more sharing."